Living in Pennsylvania, the most comfortable day I could imagine involves sleeping in on a cold winter morning with a warm blanket rapped around me. That's why I chose to make a baby quilt for my third and final gift to the triplets. 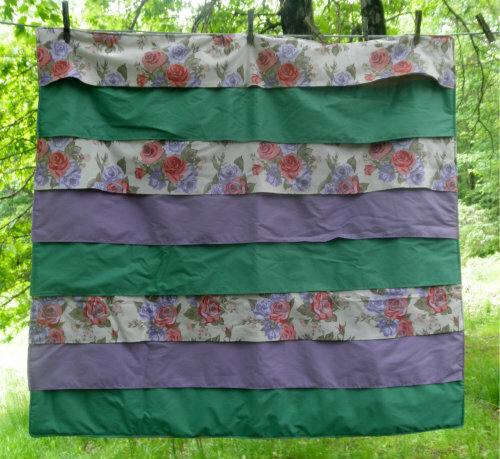 The great thing about quilts is that they are both functional and decorative. A beautiful quilt can make your whole room feel more comfortable. I've always enjoyed the luxury of owning a beautiful handmade quilt or two, but up until a week ago, had absolutely not interest in learning how to make one myself. In fact, I honestly believed that the only way to make a quilt was to spend months or even years meticulously cutting and sewing tiny little scraps of fabric until your fingers bled. Silly Me! In fact since finishing this project I've found lots of other quilt patterns that can be finished in less than a week. This particular quilt is one of the many projects that I made while taking a single Craftsy Class taught by the author of Make It Sew Modern . The class had so many projects in it, that I knew I would find something that I liked, and the way it is organized lets you do the projects in any order that you like, on your own schedule. If I decide to wait 10 years before starting the next project I will still have access to it. I love how thorough the instructor was, and how quick she was to respond to any questions. I've already signed up for my next class, The Ultimate T-Shirt. I'll let you know if it is as beneficial as the first one, once I get around to doing the lessons. I can tell you that it came with a free printable Vogue pattern, so I'm looking forward to it. Now that you have seen all three of my baby gifts, tell me about your gift giving style. Do you give practical, sentimental, or decorative gifts?